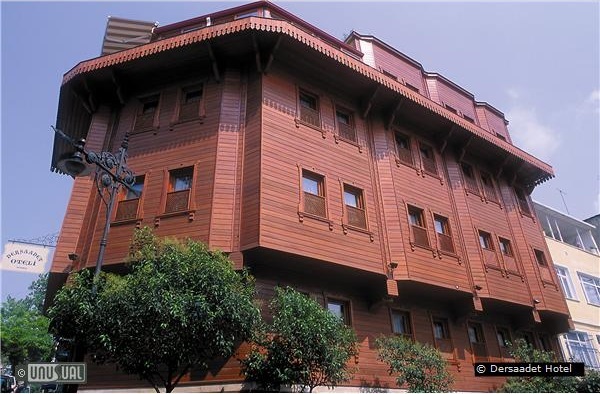 This hotel is clad in wood, replicating a late Ottoman Style homestead. Hand painted motifs in guest rooms and public spaces recreate the traditional crafts and custom furnishings that would be typical of such a dwelling. Dark wood mouldings on doors, windows and headboards; the creamy marble of the staircases, the dramatic striped marble in many of the bathrooms, and the handmade Turkish carpets in guest rooms and hallways. In the lobby, the paintings and hand-made ceiling decoration were created by local artists inspired by Ottoman-era decoration. Along the hallways and stairways, and hanging on the guest room walls, are historic photographs of 19th-century Istanbul, when it was still known among Turks as Dersaadet, the "Gate of Felicity." There are eight different styles of French-Ottoman style guest rooms at this carefully created and maintained 17-room wooden inn. 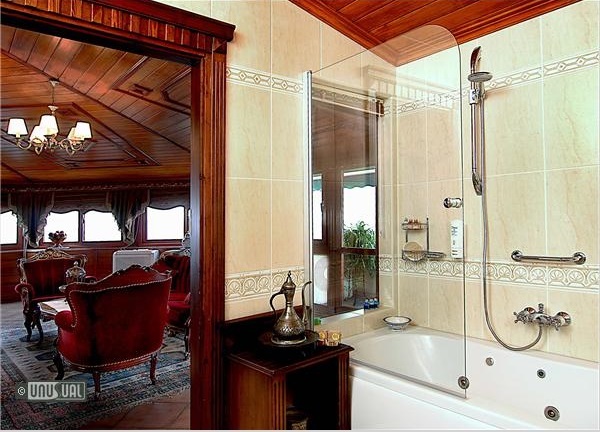 Some deluxe rooms and junior suites have mini private hamams (Turkish bath) in the rooms, while the two Dersaadet Corner Suites, and the Sultan's Penthouse Suite have fantastic views across the sea of Marmara. 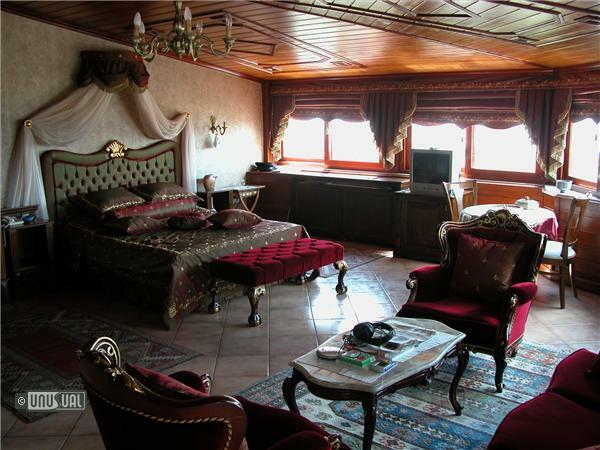 Accommodation is decorated in traditional Ottoman style, with Turkish carpets, pale wall coverings, soft wall lighting, hand-painted ceilings, and modern comforts such as private bathroom with hair-dryer, individual climate control, wireless Internet, satellite TV, minibar, and direct-dial phone. The Roof Terrace, with glass-enclosed and open-air sections, serves as a lounge/café for the exclusive use of hotel guests, year-round. A buffet breakfast is served here each morning. Throughout the day (until 23:30/11:30 pm) you may enjoy a hot or cold drink here as you watch ships steam through the Sea of Marmara and seagulls glide about the domes and minarets of the Sultanahmet (Blue) Mosque. Few properties are so close to the main sights of Istanbul as Dersaadet. 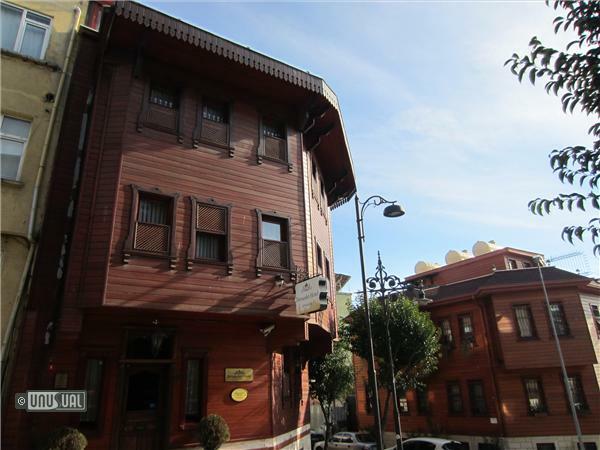 Dersaadet Hotel Istanbul is located in a residential neighborhood of local families, small hotels, shops and restaurants. Few hotels are closer to the Blue Mosque than this. Though cars and buses pass on the nearby avenue, the traffic on their quiet street is more likely to be pedestrian: children playing, or on their way to school, housewives doing their shopping, or travelers exploring the neighborhood from their hotels. Airport Transfer Service: the hotel is happy to arrange transfer from Istanbul's Atatürk Airport to the hotel. If your reservation is made directly through the UHOTW website, and is for a stay of four consecutive nights or more, this airport transfer service is complimentary. For three nights or fewer, the transfer charge is 25 Euros. They can also arrange transfers from Sabiha Gökçen Airport for a charge of 50 Euros. This mosque was built in the early 17th century and is probably the most famous mosque in the city. It is distinguished by six slender minarets and walls covered with amazing blue Iznik tiles. Open daily 9:00 am to 5:00 pm, except during prayer times. On my annual mother-daughter trip every year we set off for Istanbul! 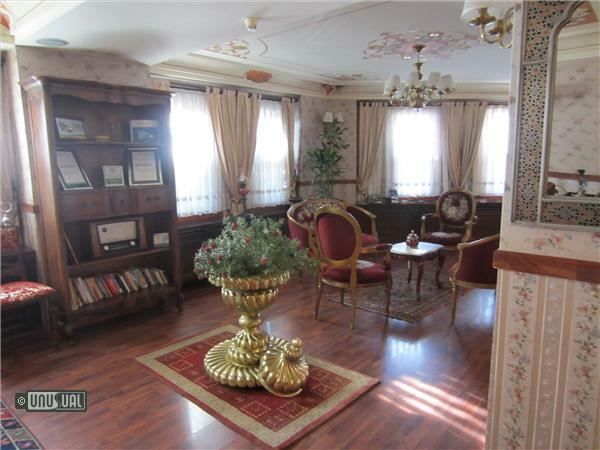 Always one to combine business with pleasure, I sought out an unusual-looking hotel, and Dersaadet certainly fit the bill. As soon as we walked in the door, we were told to make ourselves comfortable in the parlour. Kulturpark, Berlin What if.... ...you discovered an abandoned amusement park? What would you do? From June 28-July 1, 2012, Kulturpark will re-open an abandoned amusement park located in the sprawling Treptow Park in Berlin. The gate to happiness- Dersaadet! I visited Hotel Dersaadet in January with my daughter. I can really recommend this season, because you feel like you have your own private Istanbul! I discovered Dersaadet means "gate of happiness", and the friendliness of the whole staff really made us feel at home. If you are looking for a central hotel, look no further. 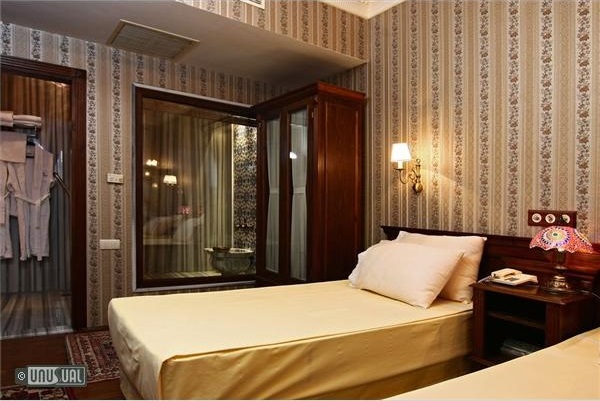 This one is smack in the center of the Sultanahmet district: you can be at the Blue Mosque, Topkapi or Aya Sofia in less than 5 minutes on foot. 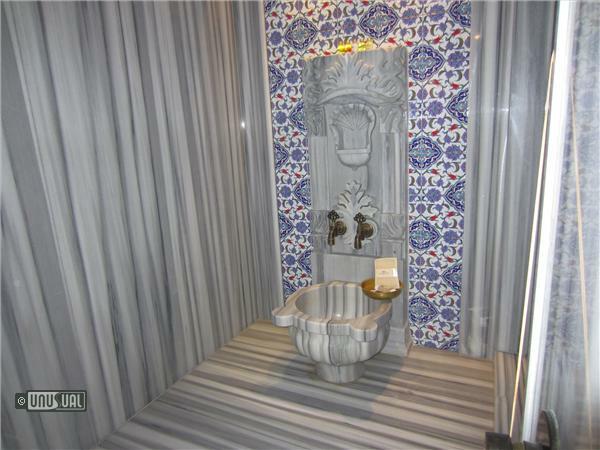 If you have a choice, go for the room with the Turkish bath- there is a huge waterfall shower ( a little 21st century addition here) along with marble walls and the traditional turkish sink and taps. And don't worry if your shower is long, the hot water keeps on coming! The hotel is located between some major mosques, and I read that you could hear the call to prayer at 5 am. Well, I was in the room that was on the ground floor with high windows and that must have helped soundproof the room, because, even though I woke up very early one morning I never heard a sound in the 3 nights I stayed there. Thanks for the free wi-fi, you people really "get it"! It worked like a charm, every time, and I didn't have to sign in every time like at some other hotels.... woo hoo! Breakfast on the roof terrace was a great way to start the day watching the Marmara sea and the seagulls passing by. 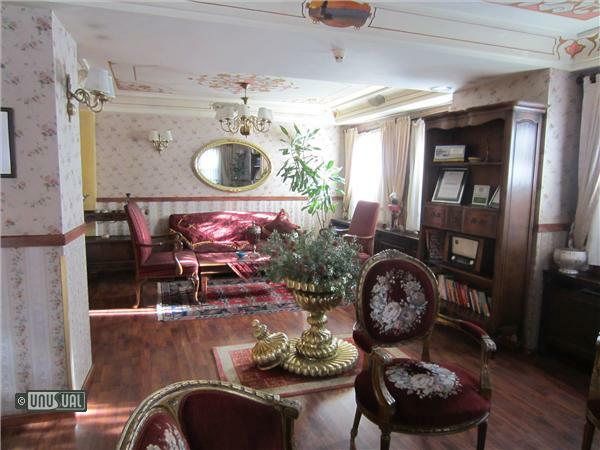 I was able to have a look at the suites too, really fit for a Sultan, with killer views. The outside was really cool, too, it's all wood and it is an old Ottoman design that is very traditional - it kind of reminded me of an ark. I would come back here in a heartbeat, for the location, the great prices and number one... the genuine Turkish hospitality that shines through. The unusual thing I tell my friends: About my own private Turkish bath in the room!